Nearest: Tube Station: Earls Court 0.2 miles (0.4 km), Railway Station: West Brompton 0.5 miles (0.8 km), Motorway: M4 Junction 1 3.5 miles (5.6 km). The Premier Inn Kensington Olympia Hotel is the made up of five separate white faced town houses converted into a single building. Its location is actually right on the A4 West Cromwell Road which is part of the main road leading into and out of West London. Its always very busy (plenty of taxis) and gives direct access by road to Heathrow Airport (about 20 minutes). The hotel is almost adjacent to Earls Court Road which has a a large range of shops and bars including Grocery shops. 350 yards along the A4 to the west is the large Tesco supermarket, while just over 400 yards to the East is the Sainsbury's supermarket. Within half a mile is the Earls Court development complex and Olympia Exhibition centre. 1/3 of a mile to the north is the fashionable shopping of Kensington High Street which itself leads to another popular landmark, Kensington Palace and Kensington Gardens (0.7 miles). The location is on the west side of the capital so the majority of attractions and nightlife are all to the east. Travelling east from here finds South Kensington, Knightsbridge and Victoria. However one mile to the south is the Kings Road, Chelsea which is a big destination both for the shopping during the day and for the nightlife in the evening. Other local attractions include Linley Sambourne House (0.4 miles), Leighton house museum (0.4 miles), Natural History Museum (0.9 miles), Royal Albert hall (1 mile) and the Science Museum (1 mile). The Premier Inn Kensington Olympia offers affordable contemporary accommodation in a prime central London location between Earls Court and Olympia exhibition centres. Just 5 minutes walk from Earls Court tube station. From this station you are on the Piccadilly line which runs into the heart of London or out to Heathrow Airport. The hotel provides bedrooms with a flat screen television, hairdryer, desk space and internet access. All rooms have a private bathroom with shower gel provided. Beds have a duvet. There are also have adapted rooms for guests with disabilities. Within the hotel is a restaurant and bar where you can enjoy a range of traditional English and Continental dishes or just sit back and relax with your favourite drink. The restaurant also serves a buffet breakfast with a range of options. The setting is modern and contemporary. The hotel has wireless internet access. Reception is always open, 24 hours. Premier Inn Kensington Earls Court: is 0.3 miles (0.4 km) away, has a guest satisfaction score of 88% and rates start from about £150. Premier Inn Hammersmith Hotel: is 1.8 miles (2.9 km) from here, earns a customer rating of 81% and base rates begin at about £87. Premier Inn Putney Bridge: 1.9 miles (3.1 km), rated at 82% and with rates from around £100. Premier Inn Victoria: 2.3 miles (3.7 km), rated at 89% and with rates from around £135. Milesfaster ranking: 223rd from 866 London hotels, 26th of 65 Premier Inn Hotels, and 51st of 329 three star rated hotels. Another to Consider: Also close by and a similar hotel (0.3 miles, 0.4 km) would be the 3 star Best Western Burns Hotel, whose lowest rates start at about £107 and which has a 76% guest satisfaction rating. The Best Western Burns Hotel also offers: free WiFi. Looking for lower base rates? Then another option might be the Kensington Court Hotel. 0.1 miles away (0.2 km), has scored 70% from former guests and whose lowest rates start at about £66 (theres free WiFi too). Why not choose a hotel with a higher customer satisfaction score? If that is what your after then the 4 Star Artist Residence London is potentially a good choice for you being 2.3 miles (3.6 km) from the Premier Inn Kensington Olympia. The Artist Residence London has an extremely high guest rating of 97%, one of the best rated London hotels. 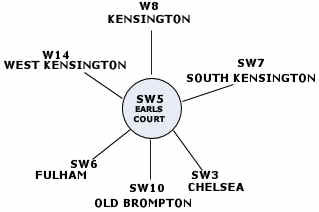 The fifty closest hotels from here (22 - 32 West Cromwell Road, SW5 postcode) that we have data for cover a 0.6 miles (1.0 km) radius. The 50 consist of 1 five star hotel (rated 88%), 25 four star hotels (average rating 81%), 19 three star hotels (average rating 74%) and 5 two star hotels (average rating 68%). Top 3 star hotels are Premier Inn Kensington Olympia (this hotel) and the Premier Inn Kensington Earls Court (both 88%). Of these hotels the highest rated are The Nadler Kensington (4 star) and also the Hotel Xenia (4 star) (both joint top with 90%). Base Rates: See how the area stacks up for low rates using base rates. We use published base rates but note these do not reflect special offers or short term discounts so remain a rough guide. We have calculated the average base rate for all the 50 nearby hotels at £99 per night. The low end of the scale shows rates from £44 at Lord Kensington Hotel (3 Star, 71%) to a high of £255 at The Bentley London (5 Star, 88%). Rate averages for each star rating: Five Star average: £255, Four Star average: £120, Three Star average: £72 and Two Star average: £62. In terms of value for money for the local area we rank Montana Hotel top. In April 2008 the hotel was one of 3 hotels bought by 'Whitbread' for £20 million pounds from the 'Real Hotel Company'. Opened as a Premier Inn in January 2009 after a total refurbishment.